The Movement for the Actualisation of the Sovereign State of Biafra (MASSOB) has condemned the recent visit of the South-East Governors Forum to President Muhammadu Buhari. MASSOB said that the governorsâ€™ visit to thank President Buhari for the purported constructing of 2nd Niger Bridge was an act of inferiority complex. The group also reiterated that 2019 election would mark the end of the entity called Nigeria, saying that President Buhari remains the last president of a united Nigeria. Leader of MASSOB, Mazi Uchenna Madu, who spoke, on Sunday, at a special church thanksgiving to commemorate Odumegwu Ojukwuâ€™s Memorial Day at St. Paul Catholic Church, Olori, Awgu in Awgu Council Area of Enugu state, charged Biafrans to keep faith in the struggle for Biafra. He said the so-called leaders of Ndigbo were not interested in the well-being of the common man in Igboland, rather they are interested in their pockets and what they would get from the rotten system as exhibited by the recent South East Governorsâ€™ visit to President Buhari. The MASSOB also wondered whether other regional governors have also visited the president to thank him for attempting to construct any project in their regions. â€œWhy must you thank Buhari because of the 2nd Niger Bridge; something that is your right, something by now that supposed to have been done? â€œYou are thanking him for a project that was not funded in the last three years and in the next ten years is not going to be materialistic? That is to show you the inferiority complex of our leaders,â€ he said. Madu said that the thanksgiving was to commemorate the memorial of late MASSOB leader, Dim Chukwuemeka Ojukwu, which was celebrated by pro-Biafra struggle across the Biafraland and a remember of the priceless contribution of the late Ojukwu to the freedom of Biafrans. â€œToday we are in the church to celebrate our hero, Dim Chukwuemeka Ojukwu, who joined his ancestors some years back. â€œMASSOB is very much hopeful in Biafra restoration because when we started the journey we believe that we must actualise Biafra. â€œOur faith is still strong in the struggle and we are being motivated because this is a foundation being led by our leader, Dim Chukwuemeka Ojukwu. â€œHe left a legacy that we must actualize. It is a dream that we must actualise though we believe in none violence. â€œWe still apply every other diplomatic approach but for now we have resolved not to take up arms against the state of Nigeria. 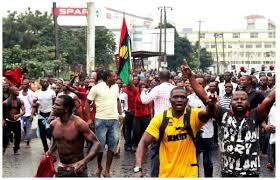 â€œThe current happening shows that the exit of Biafra from Nigeria is near. In Nigeria today nobody is talking about Nigeria; the Hausa man is not talking about Nigeria, the Yoruba man is not talking about Nigeria, Igbo man is not talking about Nigeria, and everyone is now talking about individual tribes and regions that is to tell you our mindset. â€œWe keep on saying that 2019 election will be the end of Nigeria and Buhari still remain the last president of Nigeria because we are not seeing Nigeria progress again because every segments of Nigeria is tired of Nigeria,â€ Madu said. On restructuring, he said it is the language the Igbo elites are using to enroll themselves into the mind of innocent Biafrans, while stressing that restructuring could be good, but â€œI am not seeing any of them being serious in restructuring. Some months back they were shouting restructuring; no restructuring no election that Buhari must restructure Nigeria before election but none of them are talking about restructuring again. They are now shouting Atiku, Buhari and electionâ€. Earlier his homily, the officiating priest, Rev. Fr. Lawrence Eze thanked MASSOB for conducting themselves peacefully as a corporate entity, assuring them that the church would continue to pray for them.